Finca Santa Marta is a former olive mill and farm which has been converted into a small rural hotel bursting with country atmosphere and situated in the outstanding natural landscape of Extremadura. This is an area that is a paradise for bird-watchers, walkers and artists.It consists of two original farms linked together by a pleasant patio. 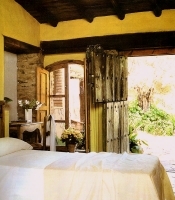 All 14 double bedrooms of the Finca have a bathroom with shower, central heating and views of the surrounding farmland. Outside there is a large swimming pool in an extensive garden set in the hilly landscape, with views of the nearby cherry and almond orchards, and the olive groves on the hills beyond.